Thanks for the shout out JennyMac! What a year you've had! So many awards, so little time! I treasure my own JennyMac award and congratulate the newest recipients. Here's to a sparkling New Year! Aw, Thanks Love for the shout out!!!! You do Give Good Blog!! Always have, always will!!! Congrats on your MANY awards! You deserve them all!!!! Aww what a wonderful lot of awards you have. Thank you for the shout out. I didn't realize I had been here that long, you have always had so many followers and comments. I like how you mix it up, serious, news, funny and personal..and of course the great drink recipe now and then. If you are ever in Boston give me a call. I know a great place for martinis. Do you like Frank Sinatra? That beach looks mighty enticing as I sit here staring out the window at the TWELVE BAZILLION FEET of snow we're buried under! Okay, it's more like five or six inches, but still. Beach. I'm up for a beach party, and putting my flip flops back on. The weekend rain, melted our snow, so maybe there is hope that the flip flops might be able to make a short appearance this week! Congratualtons on all those awards. 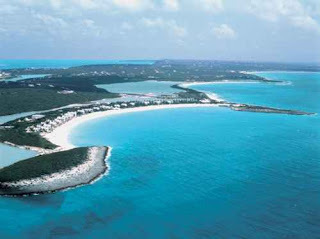 I loved Anguilla - good place to hold your celebration. Now I'm off to visit some of those blogs you recommended. Thanks for the love, Jenny Mac! Gee, You are not too popular!? LMAO!! I can see why you get tons of awards! Oh how I'd love to sit on that beach!! So glad I found this little spot of enjoyment this year; am looking forward to following along in 2010. You always do it right, Jen - reading your blog has been a true pleasure this past year! I wish you the best for 2010 - I hope it's every bit as great as this year was, and then some. p.s. the ability to leave a normal name/url seems to have disappeared on here... I never use blogger anymore! look at you, an award winning blog. How fabulous! The beach sounds fantastic about this time of year! Now that Christmas is over, I'm ready for the cold weather to leave and Spring to arrive! Merry Christmas and congrats on all your awards!!!! Your shelves must be sagging by now. Congrats on all your awards. They are all well deserved. Congrats on all the well-deserved awards. And pass me another pina colada! What a lovely sparkling mantle full of awards - and all very well deserved. I'm looking forward to sharing many a cocktail in 2010! Cap Jaluca. Where we went on our honeymoon. So perfect there. Happy holidays! I saw that beach and had to run and put on my bathing suit. Anguilla is my most favorite place on earth. FAVORITE! I want to go to that magical looking sparkly place you gave us a picture of. I need some tropical right now. Your blog is awesome! You deserve the awards lady! Cocktails, awards, and gifts? Sounds like a perfect evening to me! Gimme, gimme, gimme! I need! I need! I know I haven't been the best of bloggers of late. I have been so busy with work and re-inventing myself that I have had little time to blog nor comment. You are so fancy with all your big awards!! As the former ex-stripper in the bunch, I want to say THANK YOU!!!! I am fairly new to this BlogWorld and am really enjoying the friends I am making as well as all the talent I read. I am HONORED to be in the company of such talent and amazing people. I will most definitely post my BlogAward soon! I hope you (and everyone here) has an safe and lovely New Year!!! Ooh-does it make me a huge nerd that the thought of an amazon gift card makes me super excited? Congrats,.. you certainly deserve every one of them. Wow, so many awards! I love your blog and think you are such an amazing write, you deserve them all!! Congrats to you and those you awarded as well! How enticing that is...the sandy beach, dreaming of a drink adorned with an umbrella, the warm sun...uh...I'd better wake up. I live in the desert and the beach is definitely NOT close by. Love your blog...it's one of my most favoritest ones of all. Come on giftcard, Mama needs a new pair of shoes! LOL! Thanks for the linky love and award! And dang, Amazon! I got 25$ for Xmas there, which I am saving for a new carpet cleaner. Fun, fun, fun! PS: And CONRATS TO YOUUUUUUUUUUU!!!!! Pick me pick me! Congrats on all the awards. I always enjoy reading you, and I'm glad I found your blog this year. Why, thank you very much! I enjoy reading your blog more than is probably healthy. Excoriating, witty, hilarious in one. Keep up the good work. And thanks again for the nomination. Congratulations on all the well deserved awards. You Rock! I enjoyed my time on the beach. Now I'm going back to the couch. Your award shelf must be near collapse! Congratulations from all of the Happy Goats. What a wealth of blog awards...all deserved! Congratulations! Congrats on your awards. What a great way to celebrate. Thanks for the giveaway opp, too! I am always amazed that anyone even reads my blog, let alone likes it enough to mention it on their own, wildly popular blog! A million thanks, Jenny, for putting me on your list. In my next life I've decided to be you. Of course, that means you have to be me. I'm sorry. I know that's terribly disappointing. I don't make the rules. Raising my Diet Coke to toast a new year of 'bloggy' friendships! So glad we bumped into each other at this virtual beach party! Thanks for the new sites to check out. Hope you had a wonderful holiday! I love awards night at the JennyMac's cocktail party! Congrats on all of the awards!!! Sign me up for the beach party! You are so fabulous! You make a blog award giving post so interesting! I am glad to have found your blog this year! Excellent way to end the year! Happy New Year, Jenny Mac! Enjoy the full Blue Moon on the 31st of December! It won't happen again on 12/31 for another 19 years! Thanks for the award. I've received it before but to get it from the creator herself.... double the fun! Thanks also for the mention - and for your friendship these past months. Congrats on your awards! And congrats to all teh winners. I will go check out the winning blogs ASAP! Congratulations on all the awards! You deserve every single one of them, and more! Congrats on the awards. I get them from time to time and can never remember to share. Thanks so much; you've given your sassafrass award to me and I love love love it! What if I already KNOW them? HA. "Blogs provide so many of us a voice, an outlet, and a great opportunity to "meet" people we may otherwise never had the chance to meet. I am glad to be a participant" - I'll raise my glass to that fabulous statement, Jenny. I hope you are having a wonderful holiday season. 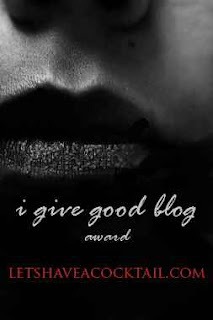 My cherished 'I give good blog' award has an honored place on my mantle...aka sidebar. Mmmmmmmmmm. I could deal with that locale right about now! Hope you had a fabulous holiday lady! Thank You for the nod JennyM but if my name comes out of the hat instead of an Amazon card to me I would prefer you address the envelope to a shelter in your area either for women or vets. Thanks very much, Jennymac! I appreciate it. Your blog is one that I so enjoy reading, it wakes me up when I visit you. You deserve those nice awards! Congrats on your awards! You are the most deserving blogger around! Ah, swag. I wish I could go to places where they gave me a swag bag. That would rock. Methinks I'm living the wrong life. Thanks for the award! I can't wait to throw it up for my final post of the year, which will be, coincidentally, post #100. I read all the way through your blog awards not for the swag - but to see who you mention - I figure if someone as good-goshes-awesome as you reccommend someone - I'm gonna find some time and go give 'em an eyeball. Congratulations on all of the awards. You need to go get yourself an reinforced shelf! Thank you so much for mentioning mine. I am truly, pleasantly surprised and deeply honored. I know it is breaking the rule, but I would LOVE to give you the same I Give Good Blog award. p.s. In this beach award cocktail party, may I please have the figure of Heidi Klum? You are one of three I check every day or every day I can under my just for ME file. You make me laugh and forget about 3 tots under 3 for a little bit at a time so THANK YOU!!! 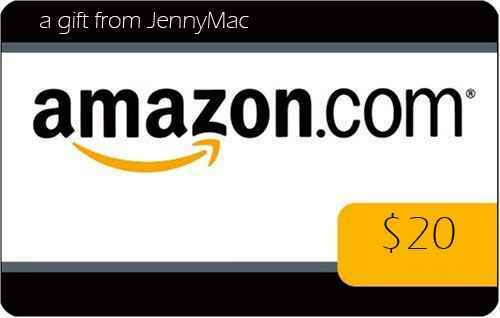 JennyMac thanks for the shout out. I'm been loving you and your blog since almost the beginning. Big hugs and congratulations on all your wonderful awards. I could totally go for that beach right about now! Postman passed your award to me and I am having a blast reading your blog just now- with, and I think you'll be happy to hear- anniversary strawberry punch. Spiked. "Touch my swag, wish you could.. I look fly, I look good!" Thanks for the love at the end of this year, and for writing one of my all time favorite blogs day after day! DANGIT WOMAN!! I could have used that card to buy me some text books for next semester... =( Don't feel too bad, I got the two I needed for $25 with shipping. Better Luck Next time. My dear friend at work spent her Christmas vacation at Cap Jaluca! She said is was fantastic! Wow that's a lot of awards - although well deserved of course! Hope you're having a fab time on the beach! Brilliant blog, I had not noticed www.letshaveacocktail.com previously in my searches!